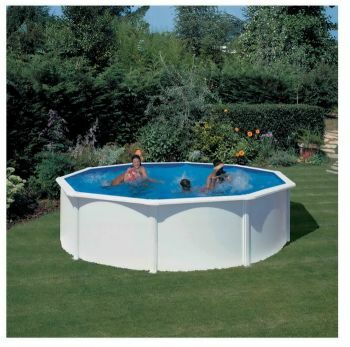 White Coral Steel Pool 5.5m diameter x 1.2m Deep- FREE DELIVERY!! These White Coral Steel Pools come in a lovely white colour, being designed for a true pool enthusiast, these pools offer great value for money and look stuning. With its SUPER-TOUGH blue liner and high quality, incredibly strong metal frame, you will enjoy a pool that is easy to assemble, beautiful to look at and certain to provide years of fun! The pool is also supplied with a 3500 litre per hour pump with integral sand filter, delivering great flow rate and excellent filtration qualities. The White Coral Steel Pool has steel frames and side panels and is an ideal project for the DIY'er. This range offers a significant cost advantage over many other steel pools on the market but are of comparable quality. The Pool's steel structure is coated to resist corrosion. The White Coral pool must be installed on flat level ground, ideally with a concrete base. These pools are at least 1.2 metres deep (4 foot) so provide excellent swimming capabilities. They can be left up permanently or can be dismantled and moved elsewhere or stored for the winter. The pools can also be used as an in-ground pool. This pool can easily be erected in one day! A variety of heating options are available from the high quality Elecro stainless steel heaters to a cost-effective solar panel kit. PLEASE NOTE: All filter pump units must be placed 2 metres away from the pool. We recommend that filtration is turned OFF when the pool is in operation. We recommend a smooth concrete slab as a suitable base- contact a reputable local builder for advice on local soil conditions. Failure to set up the pool on a flat, level compact ground could result in the pool's collapse or the possibility that a person lounging in the pool could be swept out. Do not lean, straddle or exert pressure on the top ring or top rim as injury or flooding could occur. Do not sit on, climb or straddle the sides of the pool. WARRANTY: This product is covered by a manufacturer's warranty. The liner, frame and the electrical components are covered for 2 years. In the event of a product failure a claim can only be made through the relevant warranty line. Please note that the manufacturer will only replace the faulty component.